You designed the famous Beatles suit…..
And the AMC Javelin — Pierre Cardin edition. Yikes!!! Was it indiscriminate licensing that got you temporarily kicked out of the “couturier’s club”? Who cares…. I’m just glad some Vogue Paris Originals of your designs are still popping up from time to time. 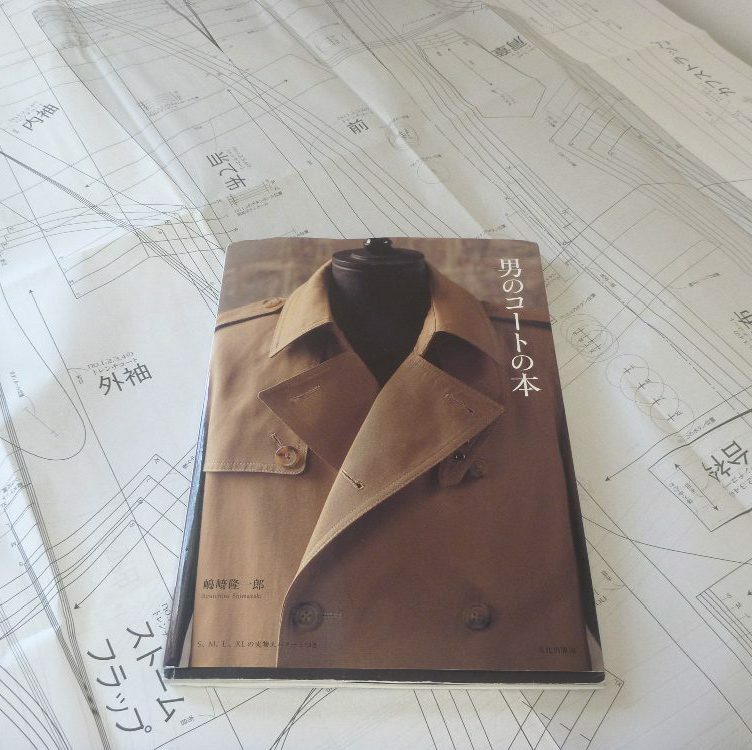 I’ve been collecting the materials to make this vintage Pierre Cardin coat since Spring. In my mind I had this coat finished by now, but……that’s the way things go when you’re a notoriously slow sewist! The fabric is a brushed Italian wool coating that I found in the upstairs 50% off room at Stonemountain and Daughter this past April. Score!!! The threads and buttons I picked up at MPB day in August. The lining will be a wine colored flannel backed satin. Tres dramatique. Oui? There’s also a “mystery fabric” that I’ll be using for welts and bound buttonholes. The real challenge has been in the fitting. It’s been a long time since I’ve started from “square one” with a pattern, and this one has proven difficult. This coat is so small I can’t even button it! (The basted lines are the center fronts, which should lay one on top of the other. Fat chance). This version is too big. Adding more room in the chest pushed the extra fabric to the back. From Pierre Cardin to…. YSL trapeze dress? This version is closer to “just right.” Not perfect, but I’m going with it. The side back is lapped over the side front about an inch, and then tapered up to underarm. All the crazy curved seams are retained. curved seams are much easier to sew than I imagined. Stay stitching and clipping make it possible. There isn’t an outrageous amount of ease in the sleeve. Kind of shocking. I really need Kenneth D. King’s new book on fitting. Santa, are you listening? Old worn out flannel sheets aren’t the best material for a fitting muslin. I’m not used to working with such fluffy fabric. To keep things as accurate as possible each piece was cut out individually. Time consuming, and hopefully worth the extra effort. Winter seems to be upon us with snow in the forecast. Time to get a move on! The curved seams are beautiful. It’s going to be an enjoyable project for you, I can tell! This will look great on you & the wool will be fun to sew!!!! Are you planning to use traditional tailoring techniques with padstitching and taping, etc? Yes. Believe it or not, the pattern calls for all of that. The fronts are interfaced and taped, the collar and stand call for pad stitching. I’m planning for some decorative topstitching on the under collar since I typically wear my coats with the collar up. This appears a real challenge, I don’t even know what pad stitching and taping is as my sewing skills are more basic. I am sure when finished it will look great and I must confess to being old enough to remember the Beatles suits. Good luck and look forward to seeing it completed. This is going to be such an elegant coat. This fabric is so cool and the dark satin lining, just brilliant. I spent hours yesterday watching the bespoke tailor Rory Duffy series “Making of a Coat” on YouTube and the episode on fitting the coat was an eye opener. It convinced me that coat making is as much of a challenge as sky diving. Can’t wait to see your coat in the wild this holiday. The welt pocket turned out perfectly. Looking forward to your progress on this! As to clipping and stay stitching curved seams, you do not need to do as much if you use a 1 cm seam allowance and use the wider seam allowances for the straighter seams. I’m looking forward to seeing this progress. Santa needs to send you that book your requested. Kenneth D King’s books are terrific. The fitting book is very detail. All his construction guides are excellent. I really want to get his dvd’s but can’t bring myself to spend 300 dollars on 2 sets of dvds on fitting and tailoring. I have his books and islander sewing tutorial for quick access. I have soft copy of the Roberto book that you use but might break down and purchase the new on at 100 bucks (yikes – or ouch). Looking forward to seeing your final coat. I love that cream color wool fabric, looks so soft luxuriously beautiful. Those crazy curvy line in the back are everything. You do an amazing job. I have Kenneth King book and I’m sorry to say that I’ve been disappointed by the explanations. I find them rather confusing. This is just a beauiful piece of tailoring. Looks as though the coat is cut a bit differently from most mens shape. The shoulders need to be wide which adds some extra cloth at front closure which is always useful. Can’t wait to see the reveal, this coat has been a favorite of all fashion followers for yrs. Better late than never, for a coat “muslin” I use a $3.99 fleece throw blankets from Ikea. Cheaper than real muslin and much closer in hand.